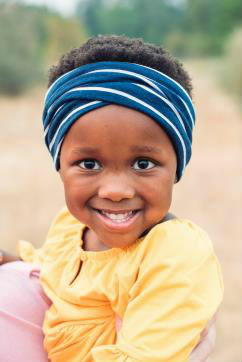 Ayazi is a sweet little girl who was born on November 21, 2014 in Port Elizabeth, South Africa. She joined her family through the gift of adoption when she was just over 3-years-old. This precious little girl has a spirit that brightens up any room, and a smile that will melt your heart. Behind her beautiful bright smile, is a little girl with a heart of a warrior. Ayazi was born with a condition called cerebral palsy. Cerebral palsy (CP) is a group of motor disorders that affect a person’s ability to move and maintain balance and posture. CP is often caused by an injury to the brain early in life and it affects the person’s ability to control their muscles. Ayazi spent her first year of life very sick. Cerebral palsy affects many areas of the body and Ayazi had difficulties swallowing, causing her to become malnourished. This required the use of a feeding tube to maintain her strength and growth. Ayazi faces daily challenges and requires various types of therapy to keep her body active and growing correctly. She also requires the use of a walker and is planning on undergoing injections to help with the spasticity in her legs. This sweet little 3-year-old is determined to keep a bright beautiful smile on her face. She is adored by her family and friends, and proves everyday how brave she is. She is very intelligent and resilient. Ayazi will be adopted as a Sparrow to Ashland High School. Students at Ashland High will work hard to raise money for Ayazi through sponsored community service and fundraising projects.